This is a request for help from anyone interested in the design of Eyewire as a game. We are trying to understand how Eyewire requires particular skills from you as a player, and trains you in those skills. Skills in this sense are discrete, atomic ideas that the player builds up to larger strategies. For background on this, you can read Dan Cook’s article on the chemistry of game design. My mission for you, should you choose to accept it, is to design what Eyewire’s skill “tree” would look like. What are Eyewire’s atomic skills, and how do they combine to create the larger strategies that difficult cells demand of you? Dan Cook gives an example of a skill tree here, this one about the basics of Tetris. Our friends at Foldit have also made a small example about the basics of Mario. 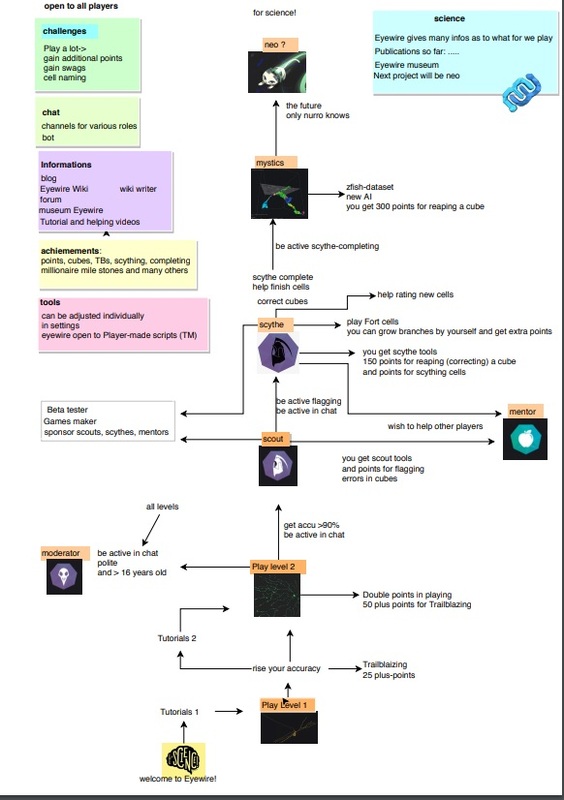 You can make your own skill tree using draw.io. When you’ve finished drawing your skill tree, please either post it here or send it to Amy at support@eyewire.org. 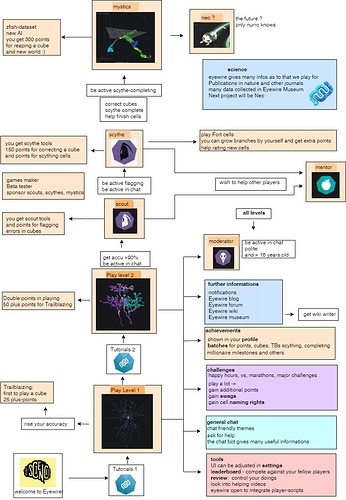 Your help in designing this skill tree will be hugely valuable to research on Eyewire and citizen science games broadly. Thank you so much for taking the time to help with this project. I am excited to see what you create, and even more excited at the potential that these trees may be used in the future development of Eyewire! Just getting started. Posting this very preliminary effort as a sanity check and perhaps help keep everyone on the same page(s). Most helpful for me at this point is to have skill lists to work with. We can figure out the mechanics and connections fairly easily given the skill lists. Any ideas? Watching the tutorial videos to try and get an idea here. Was gonna dive into things that I help with as a mentor, but there’s a lot that precedes that as far as explaining what you’re looking at before you even do anything. Heres my go at a skill tree. Hopefully it’s readable and somewhat useful. Here my provisory skill tree. 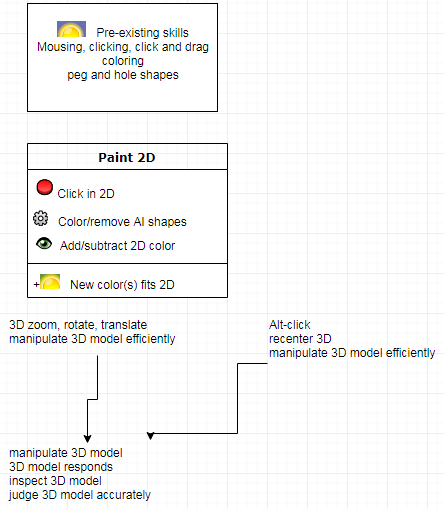 Not as professional (have problems with program) and not looking like a skill tree as in the examples. Just tried to get all into which eyewire is all about, and brighten a bit with ew-pics. A lot of valuable response! Unsurprisingly, everyone has a unique perspective, which is wonderful and desirable. Everyone also has a unique style and format, which is not so great if we ever wish to collaborate and combine our efforts. I think we can do a better job working together. I have taken the liberty of choosing a standard format we can build from. It’s a spreadsheet and not a graphic form because a spreadsheet is more readable, editable and accessible than a flowchart. I would rather spend time developing content than making it pretty. 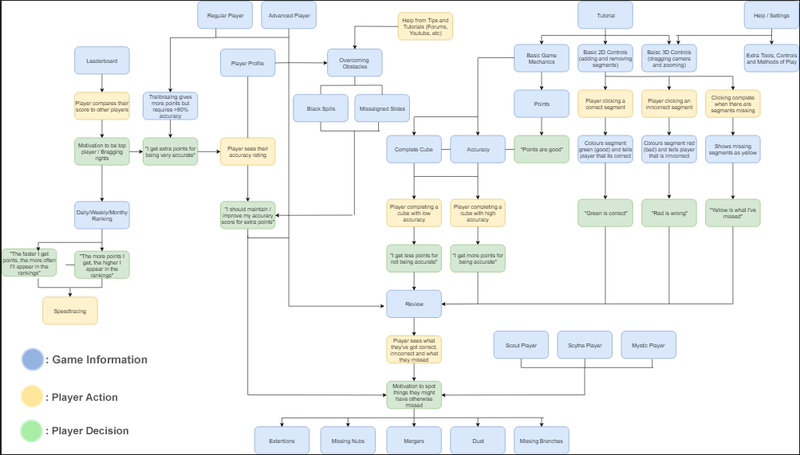 A flowchart is much easier to create at the end, after a complete outline. If you are more comfortable with flowcharts to edit and organize your thoughts, go right ahead don’t let this stop you. I have no authority. I am just another player. I also took the liberty of transcribing some of the other posts into the spreadsheet. My apologies if I did not correctly interpret or made mistakes. I tried to enter your information mostly verbatim. Please take it as feedback for what I thought I heard you say, and correct me as needed. Susi, while you provided the most complete and consistent chart, it is a very high level view and I did not transcribe much of it. I was afraid to assume too much just to fit it into my arbitrary format. It appears to have a lot of value as an overview skill outline. No doubt we will end up following it to a large degree. I hope you will contribute to the spreadsheet. I hope to have many contributors. I don’t have experience with public collaborative documents. I set this spreadsheet so any of us can edit it. To start with, I think we should maintain our own separate rows. Any edits or suggestions for other contributor entries should appear in the comment column, unless its something trivial like a spelling error. If you have suggestions or comments on the whole spreadsheet idea, please add them to the spreadsheet page provided and not clutter here. We just have to see how (if) this works out. Thanks everyone for diving into this! Great work so far! I wonder if there is a way to make a draw.io tree so that multiple people can contribute? Under File, there’s an option to share the work you’ve done. You just need to change an option from allowing others to view it to allowing to edit it. I am open for anyone to edit or take ideas from this spreadsheet. Let’s not forget the number of times we’ve had to explain to someone that they have to hit “start playing” in order to start playing. I’m gonna try and take a stab at one later on today that focuses on the tutorial but I feel like there’s a lot of oversimplifying what goes on in the first hour or two. I’m a little hesitant about this, because I haven’t done this before. So I have some knee-jerk reactions to get out: As I look at these with my preconceived notions, I bet it would be better to have skill trees for each player role (instead of one), as your example is for tetris, a simple, one player role game - which is an already extensive skill tree for the game’s simplicity! A game like Eyewire, that’s a lot! I’ve only worked with flow charts and mind maps, so this is new territory for me. Creating a map of thought processes is a cool idea, but I bet a better format will help with at least my understanding of how to go about understanding the decision-making process when playing the game. This is excellent, Susi. I even posted in Slack for the guys at Princeton who are not as familiar to Eyewire. Maybe we could also post this on a blog. It’s probably the best flow explanation that exists and it is nice to see it broken down by player roles rather than the whole game. This endeavor was spearheaded by FoldIt, where I do not think they have different player roles like we do in Eyewire. We may be the most complex citizen science game in existence! It may very well be, but this one just about breaks even lol.